Throughout the year, but especially at Thanksgiving, we are reminded to give thanks for all that we have and all those who make our lives special. 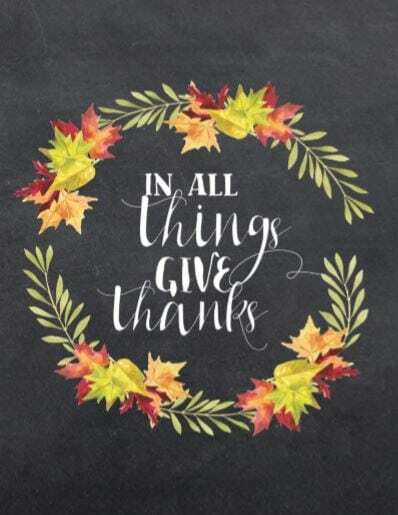 This Thanksgiving chalkboard printable, reminds us – In All Things, Give Thanks. On Thursday, we will all sit down with family and friends and give thanks for the many things in our lives for which we are thankful. 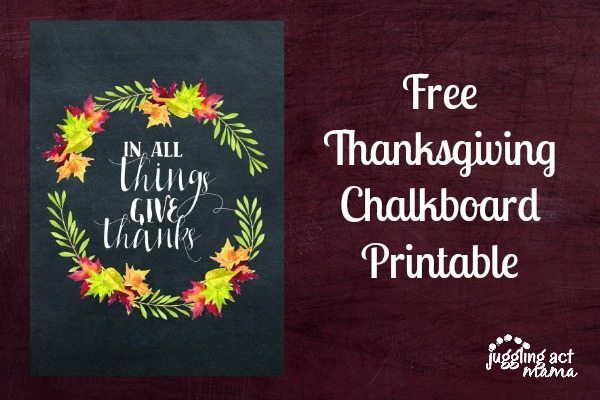 This year, I wanted to do a little decorating with that thought in mind, so I created this gorgeous (if I do say so myself) free Thanksgiving chalkboard printable. It would look great on an entry way table, mantel, or maybe even at the center of your buffet or Thanksgiving table. If you print it off and use it for your Thanksgiving celebration, I would love to see it! Snap a picture and tag @jugglingactmama on Instagram. In addition, I wanted to let all of you, my readers, know that I am immensely thankful that you come here every day to grab a recipe, a printable or check out a kid’s craft idea. All of your visits and comments brighten my day in a big way. I hope you and yours have an amazing, yummy and safe Thanksgiving. Hello! This is such a beautiful printable! I cant seem to get it to download thru the link you provided. Any tips? Thank you! Hi! Thanks for letting us know. It looks like our file storage is having issues. I’ve sent a copy to your email address. Hi – I’m having the same issues. Hi Sherri, I’ve double checked the link and the download is working perfectly. Can you give it another try?